The software company's first-quarter 2016 earnings beat guidance, and its outlook is solid, too. Engineering and design software consultancy Dassault Systemes (NASDAQOTH:DASTY) released a strong set of fourth-quarter results on Feb. 4 that hit or exceeded internal expectations. Its full-year 2016 guidance is also good, but may raise some concerns, because management predicts growth will increase in the second half. Let's take a more detailed look at what's going on with Dassault Systemes' fourth-quarter results. First, I have a couple of reference points for you. Dassault is a France-based company and reports in euros, and uses International Financial Reporting Standards, or IFRS. As such, you can think of non-IFRS reporting, which will mainly be referenced here, in the same way U.S. companies usually report non-GAAP numbers, too. In short, Dassault beat earnings and revenue guidance in the fourth quarter. The strength of the U.S. dollar benefited Dassault's results in the fourth quarter and full year. 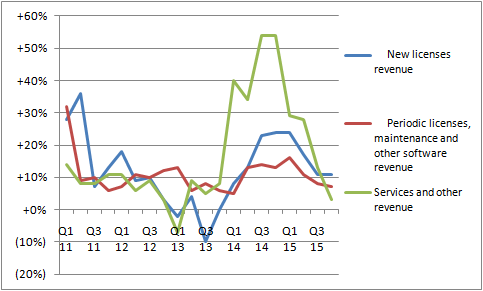 For example, fourth-quarter non-IFRS revenue growth at constant currency came in with 8% growth, but after currency translation, non-IFRS revenue increased 16% in the quarter. 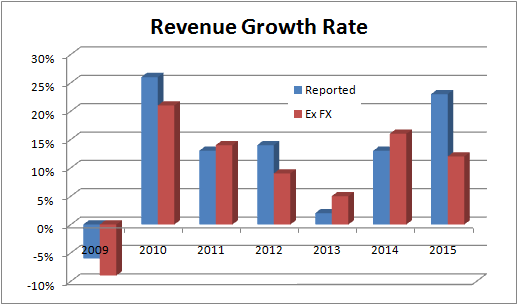 No matter: As you can see below, Dassault had another strong year of growth, even when adjusted for currency. Although 2015's constant currency growth is lower than 2014, note that in 2014 Dassault came up against a much weaker comparison from 2013. Going into the results, investors had a right to be cautious over Dassault's performance in Asia. Third-quarter non-IFRS revenue growth was flat in the Asia region, and given the concerns with China's industrial growth in the fourth quarter, investors were bracing themselves for a disappointing number. As you can see below, the outcome was an impressive 12% growth, which helped allay fears of a systematic slowdown in Asia. DATA SOURCE: DASSAULT SYSTEMES PRESENTATIONS. YEAR-OVER-YEAR GROWTH FOR THE LAST FOUR QUARTERS. Although new licenses comprised just 25.6% of revenue in 2015, it's the key to growth prospects at the company. Simply put, new licenses lead into what Dassault calls periodic licenses, maintenance, and other software growth (62.6% of 2015 revenue), and services and other revenue ( 11.8%). Going into the fourth quarter, management predicted organic new licenses revenue would grow by double digits (an improvement over the third quarter's 9% growth), and Dassault duly delivered with 11% growth in the fourth quarter and the full year. 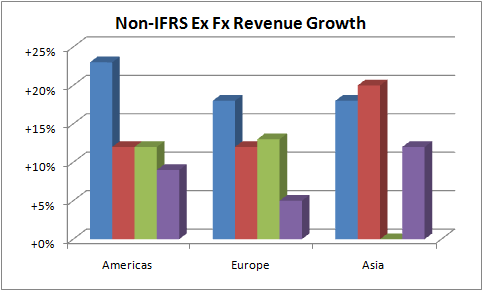 The chart below shows how non-IFRS new licenses revenue growth has remained at a double-digit pace throughout 2015. DATA SOURCE: DASSAULT SYSTEMES PRESENTATIONS. YEAR-OVER-YEAR REVENUE GROWTH. FIGURES ARE NON-IFRS CONSTANT CURRENCY. This is where it gets a bit tricky. Essentially, management argued that growth in 2016 would be back-end loaded. This means it would be stronger in the second half, thus creating the optics of a weakening in the first half. CFO Thibault de Tersant predicted, "We are initiating our financial objectives for 2016, with double-digits organic new licenses revenue growth for a third year in a row, and total revenue growth of about 7%, both goals in constant currencies. We anticipate a more back-end loaded year based upon the environment." The slowing of growth in the first quarter, partly due to a comparison with strong numbers from last year's first quarter, shouldn't unduly worry investors. Management has done a good job of flagging it up. Now, it needs to deliver. Meanwhile, guidance for full-year 2016 organic non-IFRS double-digit growth in new licenses demonstrates strong underlying growth and offers the prospect of strong long-term earnings and cash flow generation in the future.